It is admittedly hard to grade something as plot-less and pointless as a movie with “Jackass” anywhere in the title. But with such a large percentage of viewers heading to theaters, video stores, and online to see these glorified pranks, it’s safe to say that even so-called “pointless” viewing has its place. Let it be underscored from the outset, though, that Jackass’ Bad Grandpa is anything but plotless. It follows 8-year-old “Billy” (Jackson Nicoll) as his deadbeat mother (Georgina Cates) comes into legal trouble, leaving him in the care of 86-year-old “Irving Zisman” (Johnny Knoxville), his grandfather. Grandpa just lost his old battle-axe of a wife (Catherine Keener) over whom he grieves as she lies in a coffin at her funeral and says sweet-sounding words. He doesn’t want to take care of any kid. He is ready to give the boy back to his even-more-of-a-loser father, “Chuck” (Greg Harris) right from the start. Much to the dismay of everyone who runs into gramps and poor young Billy, it is impossible to not notice the criminal level of irresponsibility on the part of old Irving. It is still undetermined how many calls to child protective services were placed during the making of this film. When Irving tries to take Billy back from Nebraska to North Carolina, everyone gets to see an ambitious (and strangely physically active) grandpa behave very unlike any grandpa we are used to. And that’s what makes Bad Grandpa a nice, Jackass-style distraction that isn’t afraid to get obscene and daring. We love it because it’s just damn fun to watch people get duped. Some of the same put-ons from the movie series are used here, but with what it tries to do, we have to wait to really see some acting. But when it finally happens, *gasp* an actually meaningful story has developed by the movie’s end (I know. I wouldn’t have believed it either). It never is much to work with, and fans of Jackass will have to wait longer between gags than they are used to, but there is no denying its affect. Johnny Knoxville alone is enough of a status symbol that his dressing as an old man and walking around in stores, bars, bingo halls, and strip clubs and creeping people the hell out is worth the price of the ticket or cost of the rented DVD. 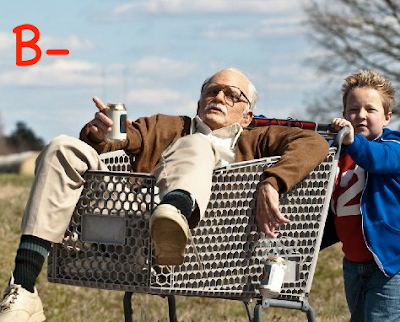 If you loved any of the Jackass movies, you’ll have a soft spot for Bad Grandpa. I can just about guarantee it.